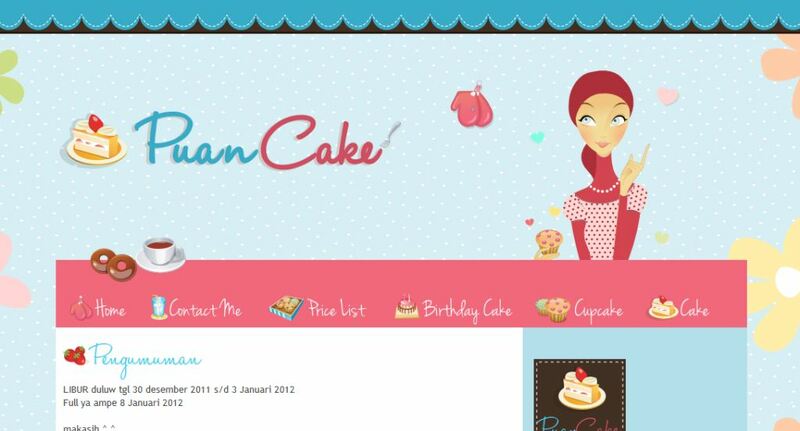 Finally, cake custom blog template ordered by Sist Dessy from Puan Cake has finished. She likes combination of soft blue, pink, and brown color. She also likes a simple layout so I decide to create two columns layout with wide enough post page and sidebar. Look at all cutes cake and cupcake graphics on header, post, sidebar, and footer, that really describe Puan Cake business. I also add woman graphic on header to represent the owner. Check my another cute blog design. Define the different types template so that can be used and know about it in this template so grateful post shared on the site. Pesan cake template so nice and more fantastic cake so that can be know that and enjoy it in this very grateful and more fantastic site that can be more enjoy it. hi ipie toon, mau tanya klo mau buat design utk blog brapa harganya? bole kirim email ke jessica-jap@hotmail.com ? thanksss. mau donk di Buatin 1 Template , tapi seo frendly Yaa... berapa harganya? This is very enjoyable and interesting day because in this cake has been design so nice and more interesting so that can be enjoy it in this site. Mostly people are very like it and enjoy it in this cake .